Gimp Latest Stable Version - A new version of the free and open source image editor was released. Yep, it's Gimp 2.8.20! This is a bug fixes release. Almost of you know, GIMP is an acronym for GNU Image Manipulation Program, is best free image editor program alternative image editing programs Adobe Photoshop. The most noticeable one being changes to the weird initial user interface language selection on macOS to make it use the user’s preferred language. 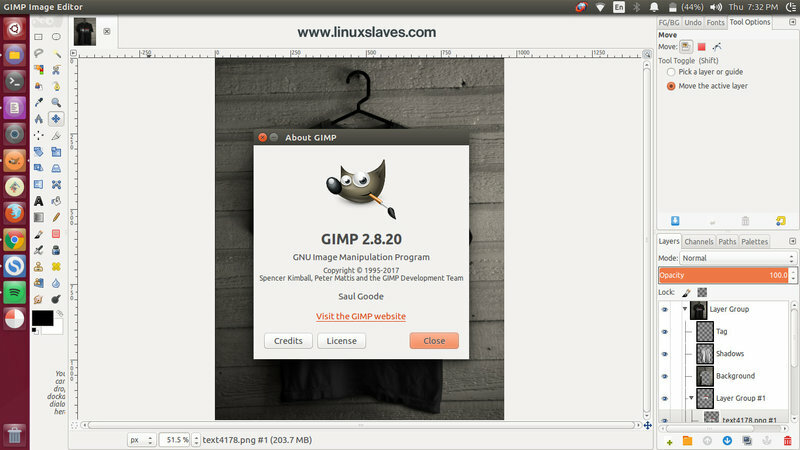 To install / upgrade the latest Gimp stable from older version we'll use otto06217's PPA. This works for Ubuntu including : 12.04 LTS Precise Pangolin, 14.04 LTS Trusty Tahr, 16.04 Xenial Xerus, 16.10 Yakkety Yak, and its variant like Linux Mint and Elementary OS. So that's all I can write about a guide to update / install Gimp 2.8.20 stable on Ubuntu based distribution. Hope you've enjoyed reading this tutorial as much I’ve enjoyed writing it and thanks for visiting us.